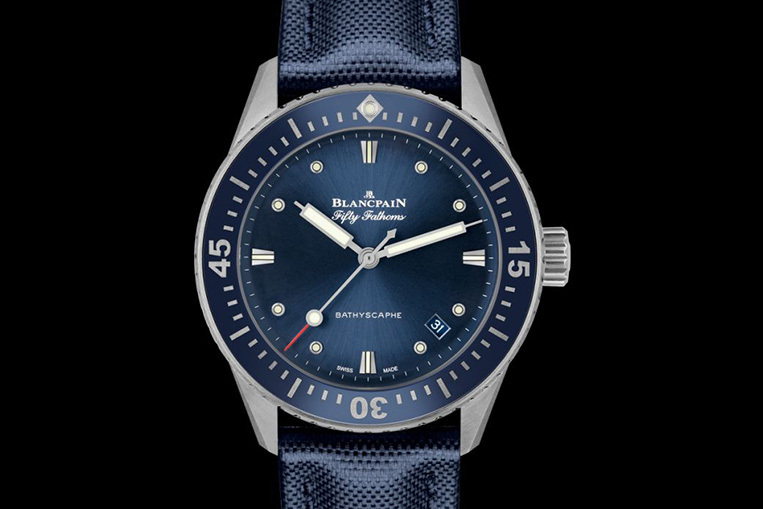 Blancpain Fifty Fathoms ‘Bathyscaphe’ 38 | Watchfinder & Co. The watch has been resoundingly popular not only among professional divers, but also diving hobbyists and landlubbers alike. It has seen a number of editions throughout the years, with the first ‘Bathyscaphe’ model being released in 2013 to commemorate the 60th anniversary of the original watch. This latest Fifty Fathoms ‘Bathyscaphe’ 38 is the most recent in the line, and harks back to the vintage models of the 1950s with its compact 38mm case and retro, paddle-shaped hands. A limited edition, only 99 pieces have been made. The deep ocean blue of the dial and unidirectional ceramic bezel has inspired its name, the ‘Abyss Blue’. Its numerals and indices have been applied with Liquidmetal, and—as is standard for dive watches—there is a luminous marker at the 12 o’clock marker to make the watch highly legible in the darkness. The lume is also applied to the indices and hands, and the watch has a water resistance of 300m. The Blancpain Fifty Fathoms ‘Bathyscaphe’ 38 runs on the in-house calibre 1150. This movement beats at 28,800vph and has a power reserve of 100 hours.